When there are frigid temperatures, and forecasts of ice, snow, and dreary skies, part of me cannot help but mentally travel to the opposite clime…somewhere warm and sunny, where living is relaxed and duties are a thing forgotten (for the time being at least)! Flamingos can be found at such tropical getaways, and imagery of their one-legged standing silhouette is often associated with resort lounging anyways. This year, rather than just imagining, hubby and I are actually off at a sunny Florida beach for the moment. Thus, now is the perfect time for me to share my 1940s outfit I made inspired by the “devil in pink” himself, Bernard, pet of the master of carefree lounging himself, Marvel’s inventor extraordinaire Howard Stark. (Watch this clip for a small minute of understanding!) 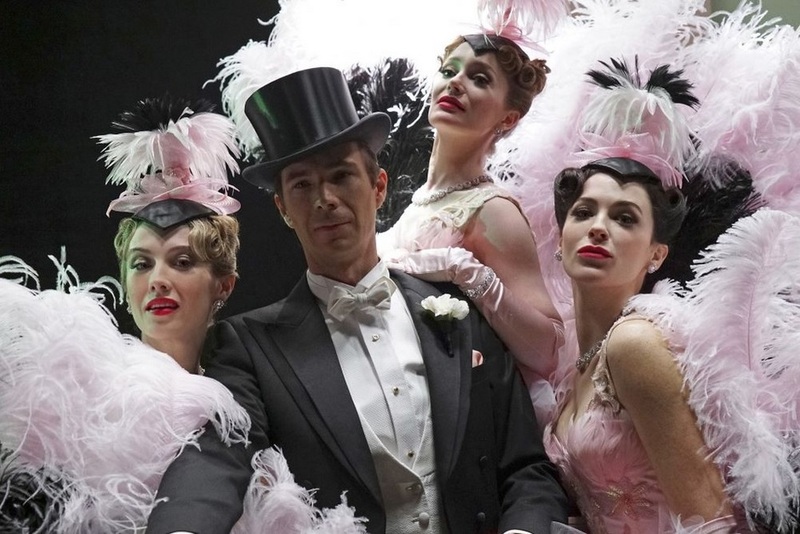 Bernard the flamingo was the loud and hard-to-handle bane of Howard’s butler, Mr. Jarvis, to the humorous amazement to the two ladies Agent Peggy Carter and Mrs. Ana Jarvis in Season Two of the Marvel TV series. 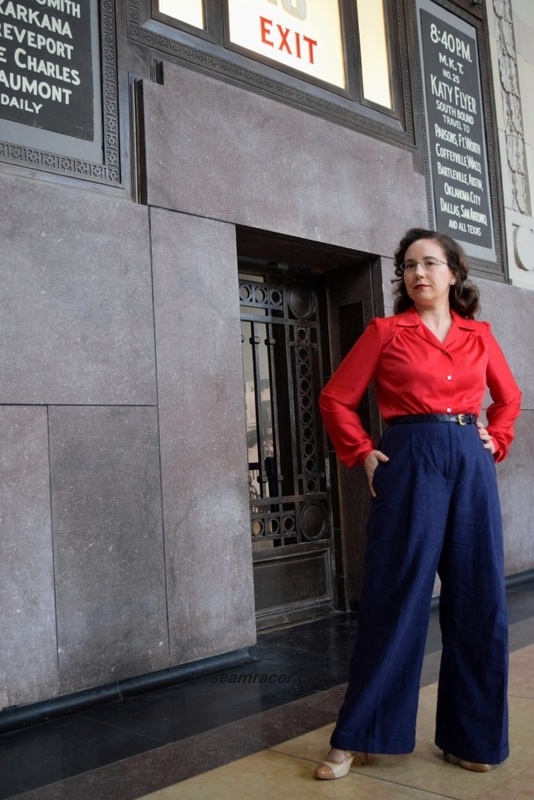 This inspiration was the perfect opportunity to channel my love of vintage, Agent Carter, and casual yet nice separates all into one handmade outfit. 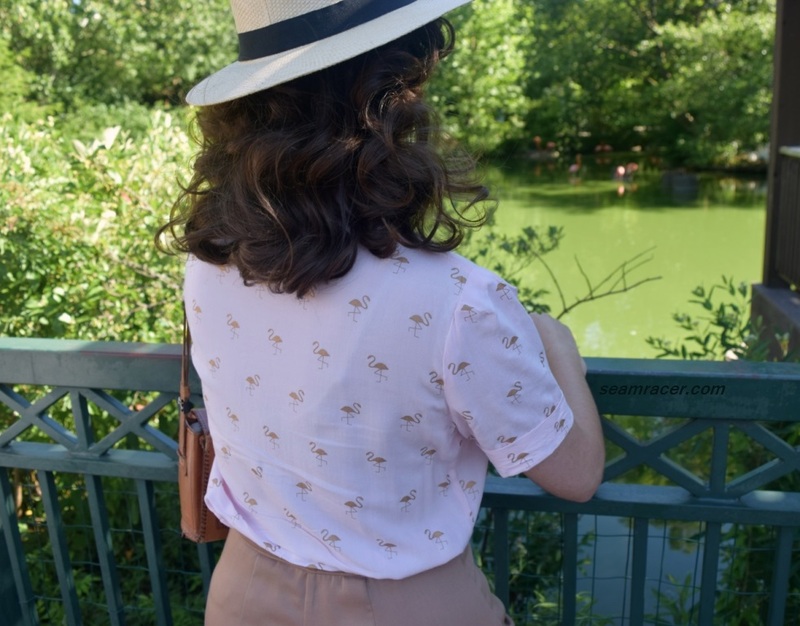 Thinking of a warmer climate basked in sunshine, my post WWII blouse has brass sun buttons and golden flamingos printed on a rich pink rayon. My trousers are a multi-climate wool blend twill in practical khaki tan with post-war style hem cuffs for a masculine touch. 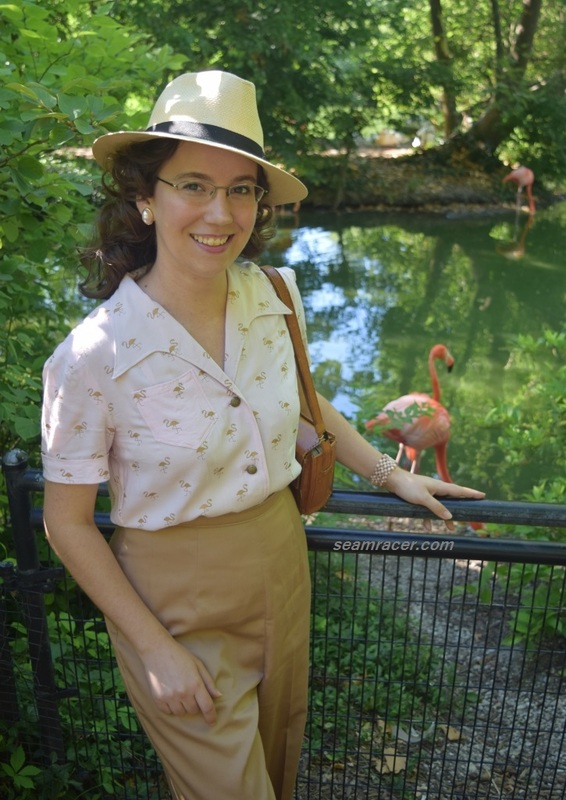 My accessories are a classic straw fedora (just like what Agent Carter had), pink patent oxford-style shoes, vintage pink pearl earrings, and an old 40’s original tooled leather box purse, the kind that were popular tourist souvenirs brought back to the states for sweethearts. I couldn’t be happier with the comfort, chic, and practical usefulness of this set! It’s a girly pink overload (with the shoes, too) in a restrained and professional way coming straight from the past. NOTIONS: I used everything from on hand – bias tapes, cotton scraps, thread, and vintage notions. My pants have an old vintage metal zipper in the side, and my blouse’s amazing sun-image buttons come from hubby’s Grandma’s stash. TIME TO COMPLETE: The blouse and the pants came together quickly – about 5 to 7 hours to make each. The blouse and the pants were finished in June of 2017. 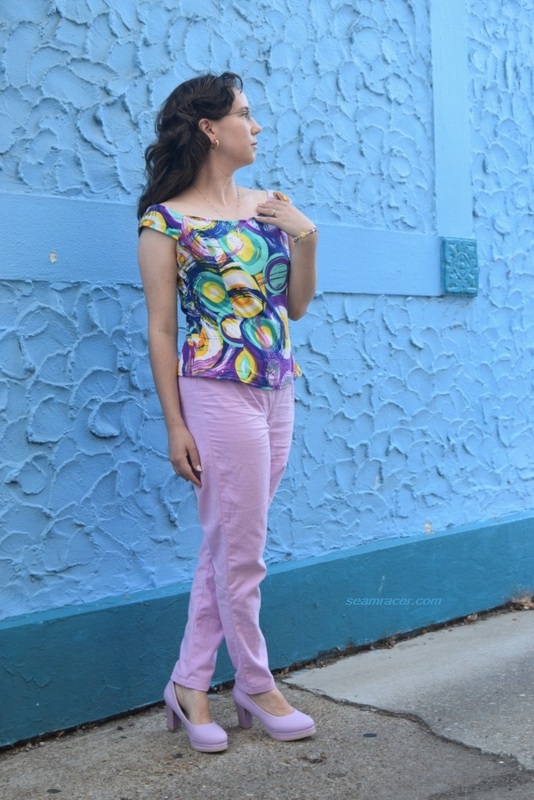 TOTAL COST: The flamingo rayon was bought in early spring 2017 at JoAnn’s fabric store, while the fabric for the pants was bought at a rummage/resale store for only $2 for 2 yards. I don’t clearly remember the total but I think the blouse and pants together might have been about $10…pretty good, right?! 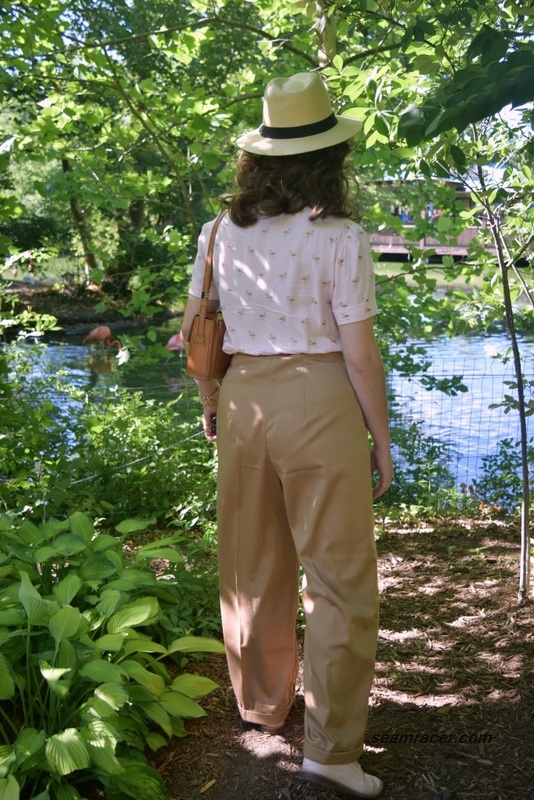 I had been saving the khaki fabric to make something that would be a staple piece which would see much wearing – weather that would be a 1940s Eisenhower jacket, vintage trousers, or a 1930s skirt, I wasn’t sure. The flamingo fabric was a sudden, spur-of-the-moment purchase – one of those things that when you first lay eyes on it, it screams to you “you need this”, and then mentally you know exactly what to do with it. The sudden purchase helped me narrow down what to do with the fabric purchase I had been hoarding. Together, these pieces are awesome, but I really do immensely appreciate how each goes with so much else in my wardrobe. Many times, spur-of-the-moment projects can satisfy one’s creative need but not really fit into one’s existing separates. Not so with this blouse! It actually looks good with khaki skirts, denim bottoms, and even some rust red and dark brown or white colored bottoms too. As for the pants… they are something I really don’t know how I lived without until now. I like them so much better than my basic black knit pants. The material is nicely substantial and wrinkle free, and doesn’t show fuzz the same as a dark color would. When my pants are worn with a basic blue oxford shirt and some suspenders, I feel like vintage menswear for women wipes out modern business attire. Not even close to equal in awesomeness! Rayon challis feels remarkably soft and silky on the skin, but as this was a blouse, it needed some stability in the neckline. I didn’t want the collar and button front to be overly stiff from interfacing so I opted to use plain 100% cotton instead. This gave it a bit extra body, and kept the fabric from losing its shape, without the stiffness. As I used khaki colored cotton for the interfacing substitute, it also helped make the facing become invisible (more or less). The pink rayon is slightly sheer, but a slip or anything skin toned becomes invisible under it. 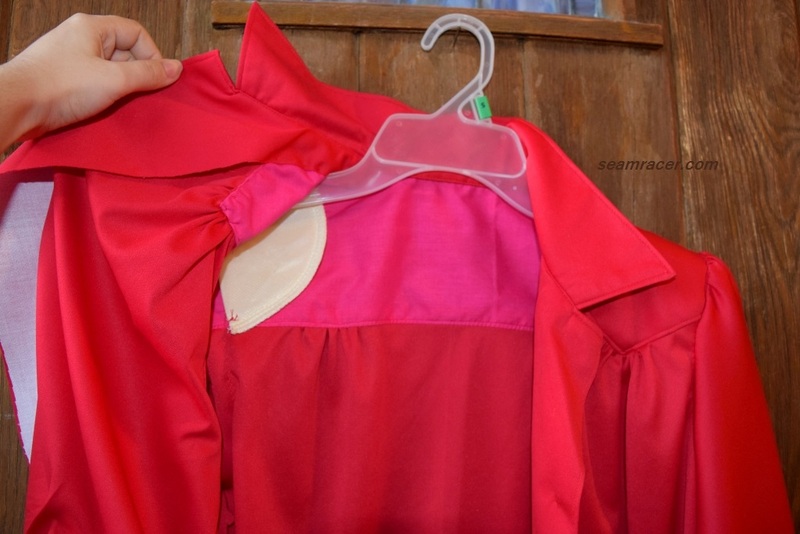 I was afraid the double layer of fabric, where the collar and button placket are faced with on big fabric piece, would be glaringly obvious, making the pink a different color there. However the flesh toned cotton interfacing happily disguised that. I do like my sewing to be well engineered, keeping up the art of beautiful insides with tricky facings as subtle as if they are not even there! Keep this in mind if you try this blouse in a light color, too! The shoulders of this blouse pattern seem to run slightly small. I have generous upper arms so I commonly have problems fitting in modern sleeves and some vintage sleeves, anyway. This pattern is definitely not the tightest in its armscye, but it could benefit from a 5/8 inch longer shoulder seam in the bodice to make it extend out to the end of my actual shoulder blade as well as a wider back for more reach room. 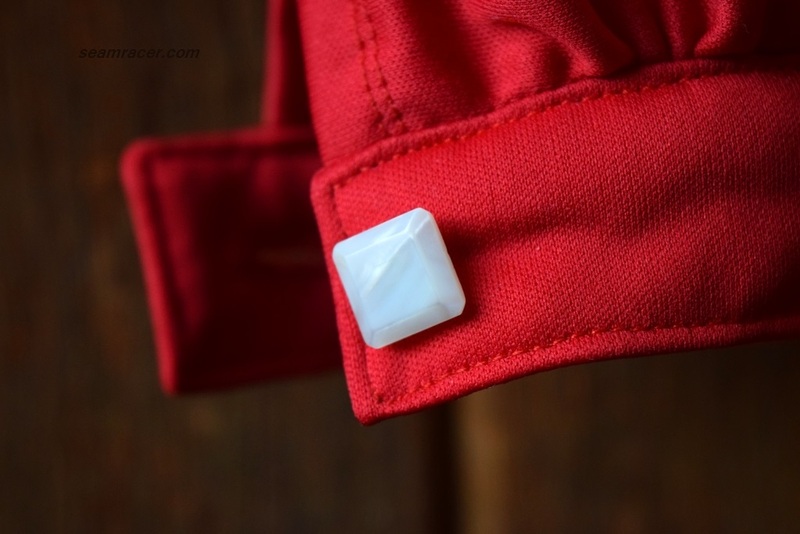 The trio of darts at the sleeve caps are such a lovely detail, and make the actual sleeve itself generous in room, so any tightness in the bodice’s armscye is easily forgivable. Besides the sleeve armscye, I did not find any major regrets to change for next time. I did however, look ahead and make a bunch of slight tweaks. 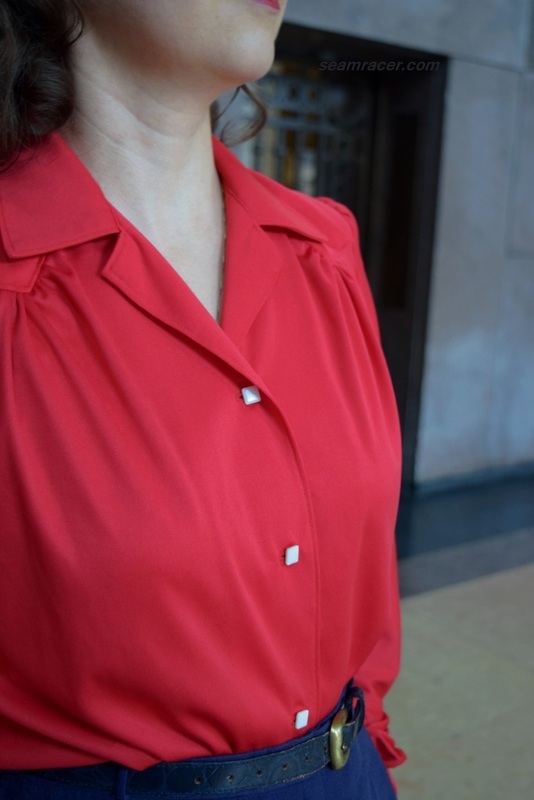 The hem length ran a bit short for a blouse to stay tucked in on its own so I lengthened the blouse the fall under my hipline. The collar was a steep curve to turn right sides out and so I snipped the seam allowances throughout down to about 1/8 inch. The facings did not lie down as nicely as they could so I made the outer hem wider for a thinner facing that meets the back neck collar seam rather than hanging over it. The recommended button placement was weird – the top button makes for a very chokingly high necked blouse while the bottom button ends right at the waistline making it hard to tuck in without looking like you have a majorly protruding belly button. I lowered the top button by over an inch and raised the bottom one by ½ inch (could have brought it up even more) with the middle one coming in between the two. Finally, I added a snap closure to close the blouse between the last third button and the hem. This below the waist snap is something I always see in vintage patterns, and it helps keep my blouses closed nicely so I added it here even though it wasn’t in the instructions I saw. 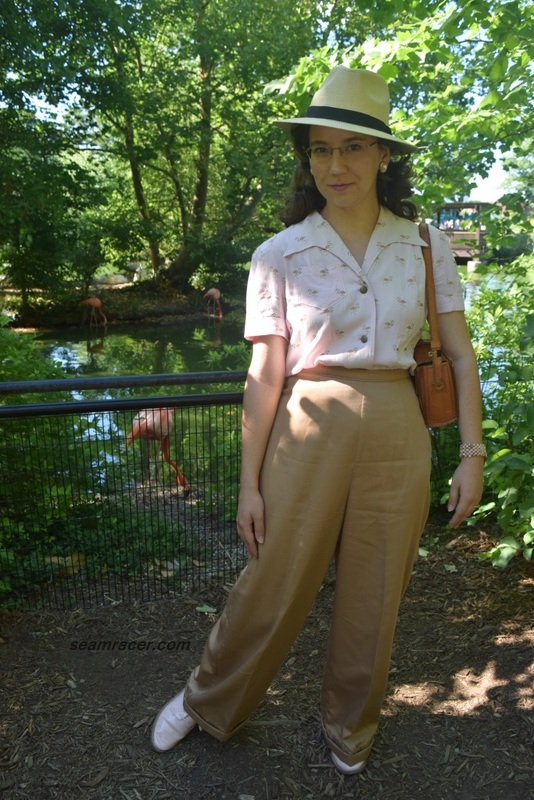 Most of these recommendations I also made to my second, sequel version of this pattern – my silk orange Agent Carter blouse, posted here. The length of the sleeve hems is something I see frequently “misunderstood” when I see versions of this pattern sewn up. Looking at the original pattern piece, the extra length to the sleeves might appear as a ¾ length sleeve. I installed my sleeve unhemmed to see for myself, and yes, it turns out as long as a ¾ sleeve. I did not like this look in the least on my blouse, nor did the sleeves strike me as having the right shaping to give elbow room to be a ¾ sleeve. Even if you do the instructed 5 something inch hem this makes the sleeve above elbow length, just like what you see on the silky red version on the model images on Simplicity’s site. 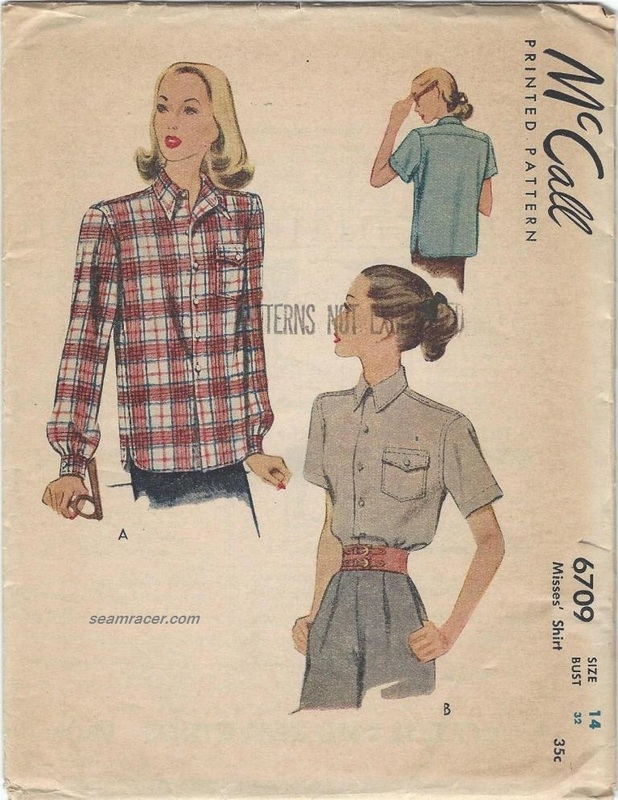 If you look at the original old pattern’s cover, the sleeves are meant to be cuffed, and honestly I think a shorter, mid-bicep sleeve looks better with this blouse, anyway. It takes a lot of extra fabric to give room for cuffs, and I find it so weird, confusing and misleading that the line drawings and made-up versions to this pattern seems to inexplicably “forget” to show sleeve cuffs, throwing many sewers off with this pattern. If the versions of this blouse that I am seeing are longer sleeved because they are intended to be so, because they like them that way, then that is another story and all fine and good. But it sure seems the sleeves are this way because of a glitch on Simplicity’s part, since the pattern works out just fine being cuffed without making any changes. I am wondering how many don’t see the sleeves were originally meant to be cuffed, and they don’t realize that in the extra hem length as the pattern intends all because Simplicity “forgot” about it in their modern make-up. Every little detail matters when it comes to vintage – that is what makes it so loved, so likable, so unique, and so timelessly wearable. Speaking of the sleeve cuffs, since I had made these pants before, and they fit me out of the envelope with no changes needed, I was comfy with the assurance of a good finished pair of pants and therefore played around with the long hem to add cuffs at the hem. Each is cuff is tacked down in four places – one at each side seam, and one at the center fronts and backs. This is what I did for the cuffs of my blouse sleeves, as well. Cuffs are somewhat confusing because you have to over account for the extra fabric, but as I had my previous pair of pants to measure from and I had just done the cuffs on my blouse, I felt more to grips with making cuffs on my pants. I think I would have preferred the cuffs to be a bit wider, now that I look at them, but I feel like they match the blouse this way, add a touch of masculinity, and bring my WWII era pattern up to date with the freedom from rationing that would have been the case with a 1948 outfit. For these pictures, I had a good taste of how Bernard could easily have been a bothersome handful which was his reputation when we visited the flamingo pond in our town’s zoo. I was a yard or so away from a flamingo fight and they were totally unafraid of people. For all their socialness in the pond, they can really get into things with each other! Their noise quickly turned into a harsh and grating ruckus, and the two fighters walked away with a pride that was really laughable for their movements. Bernard the pet had no intentions of acting like a pet in the least if he was anything like the flamingos I saw! In ancient culture, flamingos represent a calming confidence. It can also stand for femininity and a firm outspoken attitude. Combine all of these together and there is one awesome combo to stand for an interesting creature. The wild, unpredictable brashness of the flamingo was sort of a running joke and source of humor to the creators of Marvel’s Agent Carter, some of whom I hear were pecked at and chased down by Bernard off set. A trio of Agent Carter ladies had show-girl style flamingo inspired outfits for the song and dance sequence in the beginning of the 9th episode, and from what I have seen on the social media sites of some of the actors/actresses, but especially the costume designer Gigi Melton, anything flamingo related (brooches, novelty fabric, fan art) is appreciated. So – this outfit is to all of that quality entertainment, killer vintage style, and much-needed inspiring characters which is Agent Carter. You will be seeing my pants making recurring comebacks to match with some of my future to-be-posted blouses. Other than that, don’t fall over when you try to stand like a flamingo, and I will be back at home to share something closer to my winter clime when I give you my next post. Here’s to happy sewing everyone! Picture a breathtaking scene of a pastel colored, dramatic sunrise, eclipsing a lovely clear night sky setting of stellar sparkling in lieu of the light of day. Such a sight is sadly not to be seen most mornings. I see such a sight sometimes in our winter season if I suffer through the misery of waking up extra early and bundling up to brave the elements. Now, I can at least wear a vintage-inspired set that calls such a display to mind for me! To me, it has all the elements of one of my favorite paintings…”The Starry Night”, painted by Vincent Van Gogh in 1889. 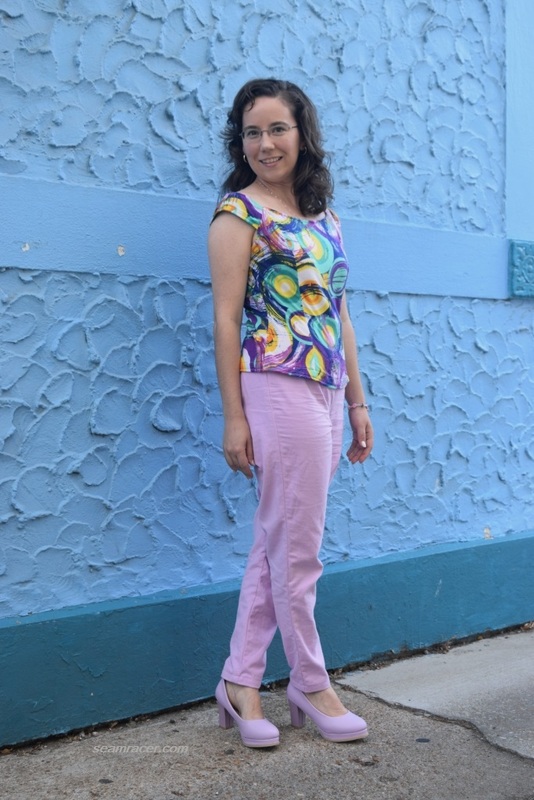 With a richly cobalt textured “sky” behind me, and colorful, swirling bursts of movement above a creamy pastel palate below, this Burda outfit is a means for me to wear art in my everyday life. Sewing can be an art form in itself, anyway. My first, real, riveting fascination with this piece from Van Gogh was through “The Christmas Wish” episode of the infant videos, “Baby Einstein”. When our son was one year old in 2013, we were given a handful of “Baby Einstein” DVD’s, and he would be just as relaxed and mesmerized as I was watching them. 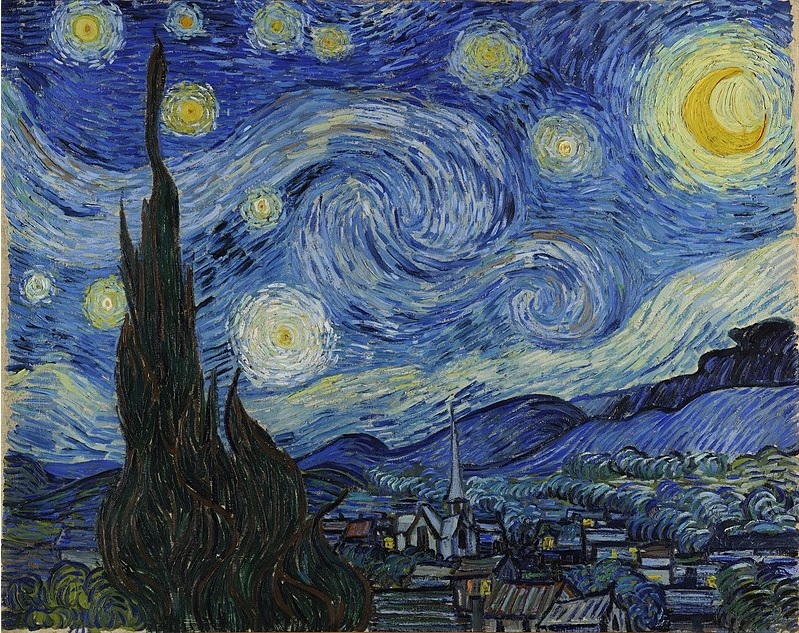 They would show details of “The Starry Night” by Van Gogh along to the music of “Für Elise” by Ludwig van Beethoven. This combo of picture and music has henceforth been intertwined in my mind, which associates both with something lovely which puts me in a happy place. 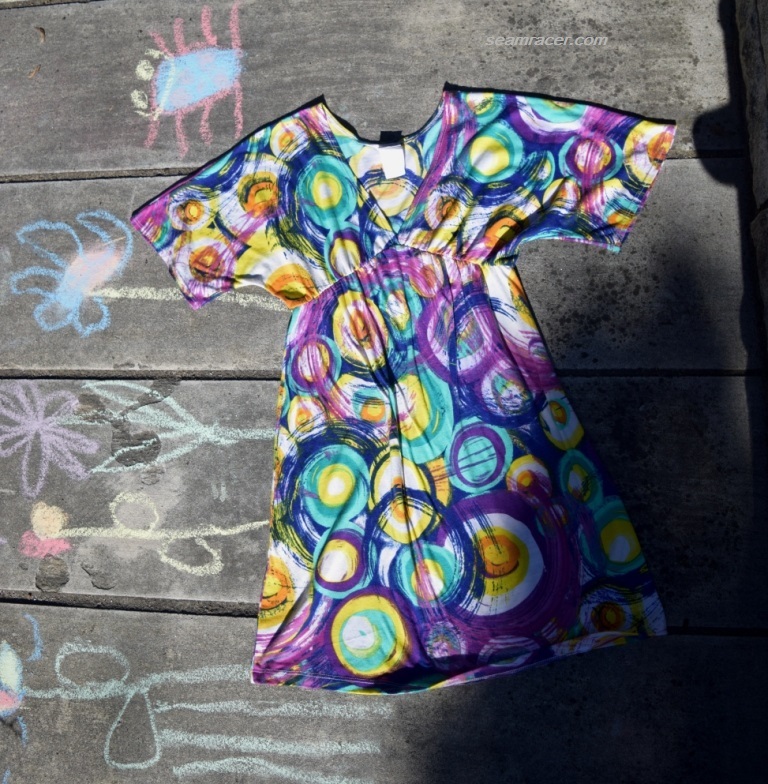 This is partly why it seems so very fitting for me to take an old maternity tunic, and turn it into something which completes this artwork inspired outfit. My second and strongly passionate reason for saving my old maternity tunic is also the fact it is an old “Made in the U.S.A” garment, besides the wonderful feel and print of the fabric. Just as Van Gogh conveyed the sky abstractedly in his own personal way, I too probably see the world of clothing differently (I’m sure) than others. In my opinion this is due in no small part to my ability to sew and my studyies on history. In a sea of grey, black, browns, and whatever colors are popular with the dye lots for RTW any given year, I enjoy choosing a variety of colors. The world around us is full of color and beauty, and we all have our own individual beauty and personalities, so why not give that awesomeness it’s just manifestation through what we are wearing?! I wanted new skinny pants that were not another dark color – and how could such a lovely color not make me happy (especially with matching footwear)! The shop that my pants’ twill came from as a stunning variety of incredible colors, so why not pick some out for yourself and make something special that’s all “you”, like I did here! Funny thing is, it seems as if the Versace line and I were of the same mind (though I made mine first)! Check out how scarily similar this outfit is from their Spring/Summer 2018 ready-to-wear collection! Look – it’s the same high-waisted, figure-hugging styled bottoms, in the same orchid-toned purplish pink…with matching shoes, too! 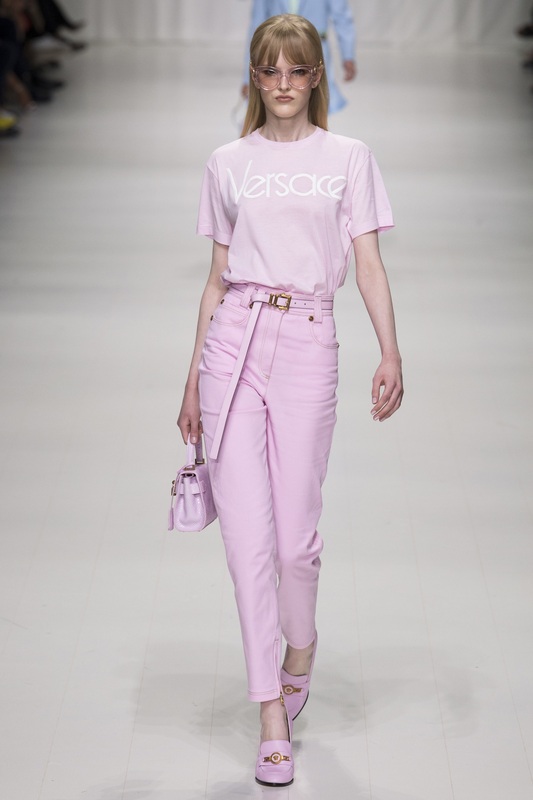 In honor of the 20th anniversary since Versace’s murder, his sister has brought back a style for next year that commemorates both the styles of the 90’s and influential celebrities who were his friends. However alike, my trousers are actually sewn using a true vintage 1957 release from Burda Style, while my top is only very vintage inspired. (I do see a slight 50’s air in a number of Versace’s items.) I’d like to think vintage offerings that come from modern patterns definitely help past eras transcend time to meld perfectly into contemporary wearing. 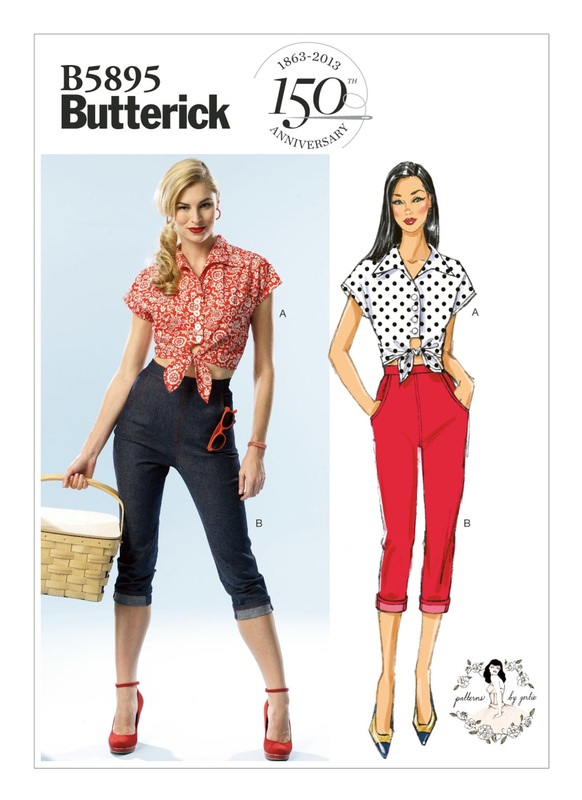 Burda Style especially does a good job at “updating” the image of vintage re-leases! Designers’ rehashing the details and trends from the past also creates a whole new appeal, too, whether people recognize it or not. What goes around comes around is certainly true in fashion. NOTIONS: I needed to buy the zipper for the pants, but otherwise the elastic, thread, bias tape, and small finishing notions were all on hand for everything else. TIME TO COMPLETE: The pants took over 20 hours – I stopped counting after that amount! They were finished on May 31, 2017. The top took maybe 3 hours to make after maybe 3 hours of decision making about how and where to cut it out! It was sewn in one afternoon, on June 13, 2017. THE INSIDES: Pretty nice! 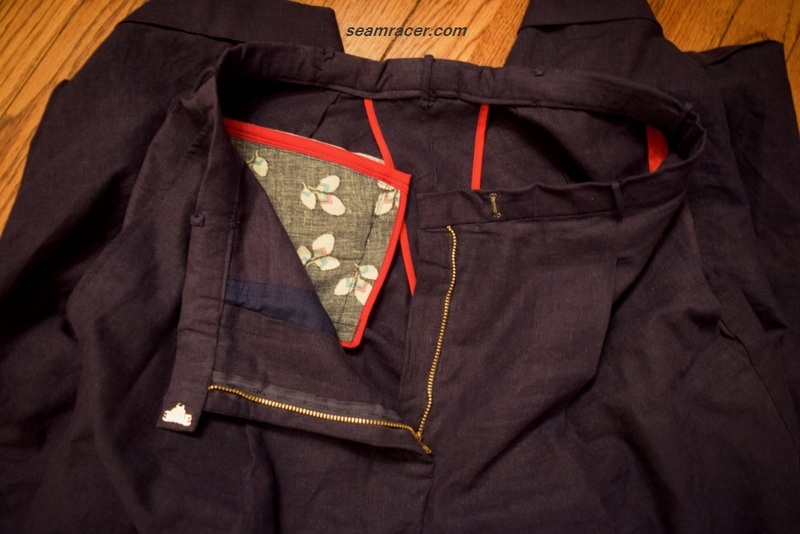 The pants have every seam edge individually covered in bias tape, while the blouse’s insides still have some of the original serging (overlocking), but the rest are merely double stitched over. TOTAL COST: I am counting the top as free because it originally came from a thrift shop, probably for a few dollars, almost 6 years back now. The pants cost me just under $15 for both material and zipper. That total is probably just as much as I would pay for the cheapest pair of RTW skinny jeans, so I’m counting that price as an awesome deal for the fit, quality, and fulfillment of personal taste that has went into my pair. I will say first off before any nitty gritty construction details that I absolutely LOVE both of these pieces. These two projects might be the most versatile and my favorite Burda Style makes in a while. The fabrics are first rate quality, and the designs of the patterns something not too readily found in RTW. That said, they were challenging to make. The top tested my mind trying to fit in the pattern pieces on the existing garment, while the pants were horribly drafted (for me at least), requiring some pretty tiring fitting. Now, as for any Burda Style pattern, printing and/or tracing is necessary to have a usable pattern to lay on your desired fabric. My pattern was traced from the downloaded and assembled PDF bought at the online store but if you have a magazine issue, use a roll of medical paper to trace your pieces from the insert sheet. It’s at this preliminary step that you pick out your proper size and add in your choice of seam allowance width. A scissor with a magnetic ruler guide helps immensely to quicken along the step to getting a finished pattern prepped. Sorry to repeat something you might already know, but this is just an “FYI” for those that don’t. I’ll start with the bottoms. I must say they do run short. I cut them the given length of the pattern, and I really didn’t have any room for a hem besides a slight bias fold in for them to come to my ankles. This was the perfect length, but I wouldn’t have liked it any shorter. I’m about 5 foot 3 inches height so anyone taller than that, figure in to make the hem longer. As I wanted a perfect body fit and ultimate practicality for the pants, I simplified the design just to the bare bones. A summary of my changes are no in-seam side pockets, no ankle zippers, no fancy waist facing, and a zipper right where I can see it…in front. For my next pair of pants from this pattern, I think I will draft a conventional zipper fly, but for this first pink pair they have an invisible zipper up the front to make them easy (versus up the center back as the pattern suggests – how awkward). To support the top of that zipper, inside at the top there is a small strip of cotton velvet ribbon (for softness!) to act like a tab placket, with a waistband hook-and-eye to close the waist. The waistband itself was made by stretching a strip of ¾ inch elastic down to the top edge, then folding it in twice and stitching that down for a wonderful body hugging, but stretchably comfortable and smooth-waisted option. Go ahead and call me “granny pants” because these are wayyyy high up on my torso! I like them that way. Come on, ladies, honestly – I’ve heard the truth from many women I’ve talked to in in town who’ve told me they like my pants. Nobody really likes to spend their entire day picking up their drawers every time they move or bend! I know I don’t like the feel that my clothes are falling off of me. With high-waisted pants, there is no awkward bulge in the wrong place (muffin-top, anyone?) just smooth waist and hip complimenting. Hips are an excellent pivot point in women’s garment design and the decade of the 1950’s used that point to perfection – that wide spot we all love to hate comes in handy when you think of it as an anchor point. A garment with a central mainstay above hips will stay in place…on ‘em, style has more of ‘sliding’ effect without the right styling. Now granted, if you want something that sits at the hip, that’s fine too. I wore everything at my hips as a teenager and still wear hip-hugging pajama bottoms. I just think store offered RTW generally doesn’t offer much that will be most complimentary to an individual figure when it comes to a variety of pants’ fit, at least not like something made for oneself. Only you know your body the best, and embrace that in whatever you feel makes you the best. I like to go with my hourglass shape, and let my hips and high true-waist anchor my pants on my body, whatever the negative connotation for this fashion. Keep in mind the fabric I used for my pants are non-stretchy – the twill material has little to no give like a knit might. A really good, sturdy, quality twill that feels and performs like a denim that will hold its shape is what I wanted and used – especially since a material like this is impossible to come by in any in town store. A non-stretchy woven is what the pattern called for anyway. I can definitely see this pants pattern being much easier to make in a knit and turning out fabulously, so there’s a lot of versatility here. The real secret to my fitting technique was to sew the center front (with the zipper) and the center back seams, then turn the pants inside out and have the side seams and inner leg seams pinned to fit around me. This was a bit more challenging than it had to be because I was working on it by myself, but I really think this is the easiest, quickest, least painful way to get a body fit. It would definitely be even easier with someone else’s assistance. Once a good fit is pinned into place I marked the seam lines on both sides with water soluble disappearing ink pen, following that line for my stitching and washing it away afterwards. As my fabric has no stretchy ‘forgiveness’, just to be on the safe side in the unforeseen chance that my body changes and I need to refit these trousers, I left a wide seam allowance…not a whole lot, but 5/8 to ¾ inches along the sides and inseam. The thick denim would feel and fit a tad better I believe without the wide seam allowances, but having the possibility to keep what I made (and love as a wardrobe staple) for the long-term is something more important to me. Speaking of items that endure from one’s wardrobe, I’ll move on to the top re-fashion. My first step was to cut off the elastic empire waist for the tunic. The body of the tunic became the bodice for my new top while the bust and sleeve sections managed to also be the new top’s sleeves. Only because of the skinny princess seamed panels was this able to be fit in on what I had. I did have to shorten the length of the hemline by two inches, but luckily that was the only way I had to “give in” and make a change for this re-fashion to work. I like a shortened length anyway! Too much fabric in the body might distract from the lovely off-shoulder sleeves. The sleeves are really made of interesting pattern pieces of small rectangles curved dramatically on one side…and it turns out just wonderful! I can completely adjust where I want the sleeves to sit on me for a slight change of look – I can pull them completely off the shoulder, or pull ‘em up like “normal” sleeves, but where they naturally sit on me is right over the angle where my shoulder ends and my arm begins. Now, the back neckline did turn out a tad generous and it sometimes looks like a draped neck, but I’m okay with that. The one major caveat is that strapless lingerie or a bandeau bra is needed with this style. Both of these pieces can be similarly found in vintage patterns and some vintage reproduction garments, which why this is included as part of my ongoing “Retro Forward with Burda Style” post series. 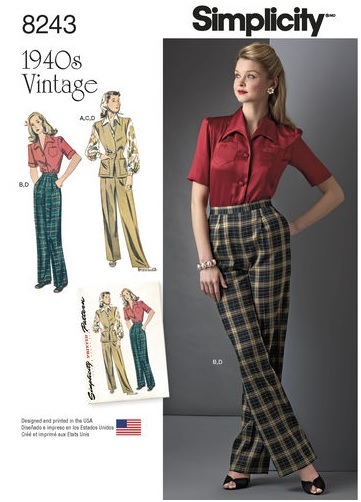 The pants are already vintage from 1957, I know, but I’ve seen several patterns that remind me of their same style (see McCall’s #9221 from 1952 and McCall’s 4024 from 1957) so I just had to share! In fact here is an interesting article to read, making me think that my pink trousers are technically “cigarette pants” or “stovepipe pants”. The blouse seems to be a recurring style in the decade of the 50’s except they seem to call it, “a scoop neck, with cap sleeves set into armholes”. 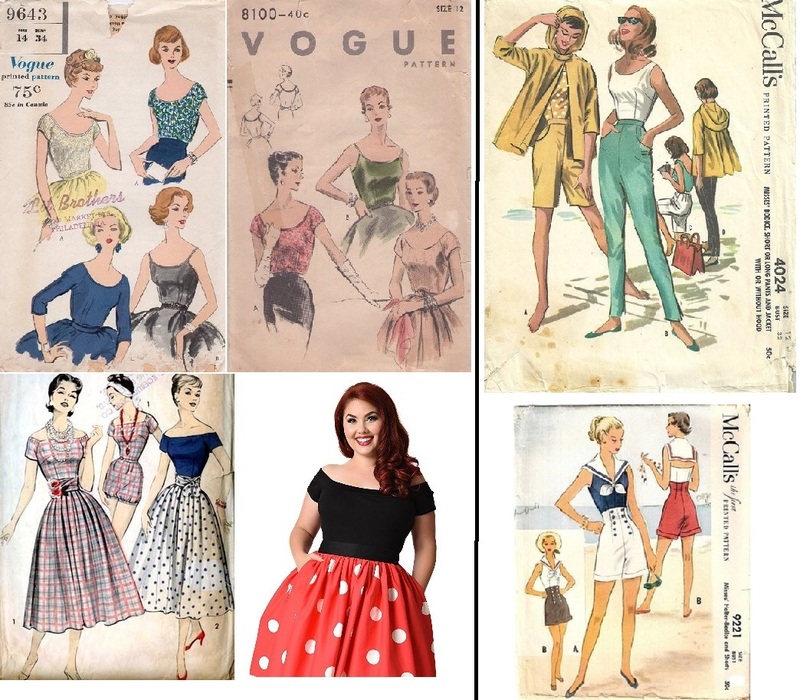 See Vogue 8100 from year 1953, Vogue 9643 year 1958, an unidentified 50’s playsuit pattern, and “Unique Vintage” company’s 1950’s Marilyn top in either plus size or misses size for a few examples. Ever since the most recent total solar eclipse several months ago (we were in the path of totality), I can actually look at this set’s inspiration in a whole new ‘light’! That afternoon for us was truly a starry night in the daytime! On a factual level, did you know Van Gogh actually painted “The Starry Night” from mental picture, as it was done during the day? So my title is right on! Do you have any artwork related creations! After last week’s first episode of the television series “Sun Records”, I’m totally in the mood for the 50’s, especially the rockabilly style (what I see as combination of both early rock and roll crowd and the spirit of a rebellious but fun loving teenager). Enjoy this while it’s here because you won’t see much rockabilly here on my blog. 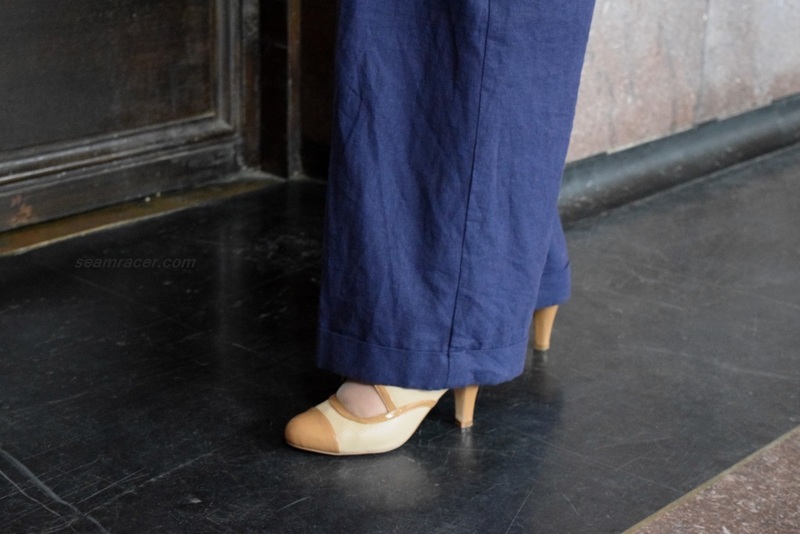 Thus, here’s a quick post on some easy denim pants sewed using a popular Butterick ‘Gertie’ pattern. This post of these jeans is my monthly submission to the March 2017 “Wardrobe Builder Project” at “Petite Passions”. Kind of like flappers and fringe of the 20’s, I personally don’t regard the Rockabilly branch of the 50’s as a mainstream part of the decade’s fashion although it has taken over much of modern “vintage” culture. From what I have read, the rebels, pin-ups and the tough crew have had far more attention due to Hollywood, the ‘shocking’ factor of what they were showing off, and modern perceptions than the position they really held in everyday dressing of the 1950s. However, it is an important, if small, niche in fashion that boldly shows how culture, music, and clothing styles go hand in hand throughout history. To read more, visit this page at The Vintage Fashion Guild. My pants are worn with a store bought tank and a thrift store belt and shoes. A lovely ruffled authentic vintage 50’s blouse (given to me from a friend) completes my rockabilly look with its red plaid. The flat heeled shoes mellow the outfit a bit, hopefully, but I did like sporting a bold pompadour roll with a ponytail! NOTIONS: I bought the bias tape as I generally do not sew with red and therefore do not have much in my stash except for a few vintage packs. The zipper, interfacing, and thread needed were on hand already. TIME TO COMPLETE: If I hadn’t needed to do unpicking these jeans would have practically made themselves up! These were made in about 5 hours on May 13, 2016. THE INSIDES: So fun!!! Every raw edge is individually bound in skinny bright red bias tape. These denims are simple because they are like a bare bones version of real jeans – closer to plain pants really. No bootie cheek pockets, rivets, and contrast stitching here, my dear readers…and I like mine this way. This makes them ultra-versatile enough to work with anything under the sun from modern to vintage of many eras (speaking of which I did wear them a layer under my 70’s shirt dress). 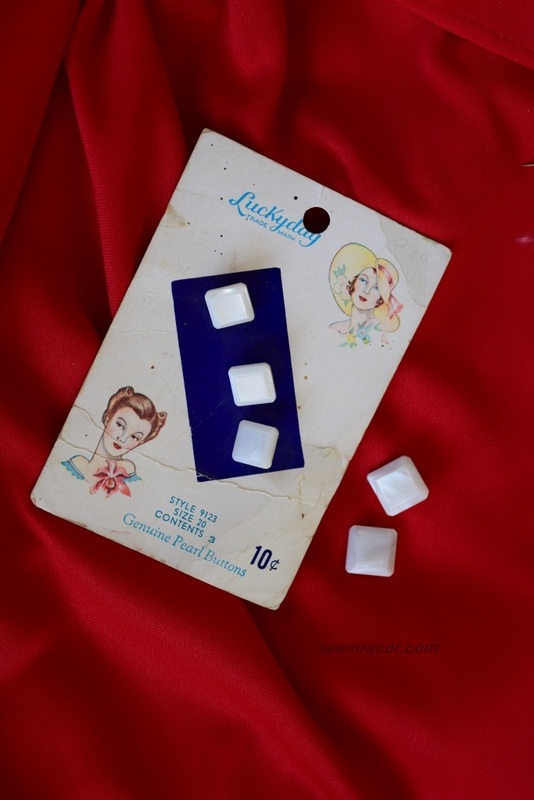 In the summer these are my favorite bottoms to my 50’s bra top. Of course, this pattern is wide open ready for personalization, such as adding on one’s own pockets and details or even sewing this in a stretch rather than a woven! I love the possibilities of this pattern and will definitely be using again…maybe with a fun colored denim next time for a really modern look! As basic as they are in style, they were just as quick to sew. However, the real shocker to this pattern was the excellent fit. 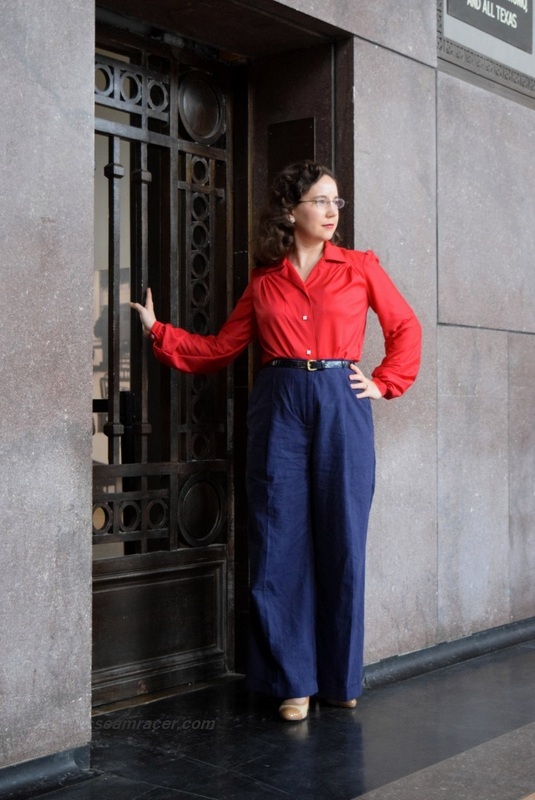 This Gertie pattern is the first modern pattern for pants/trousers that I have found to have a truly vintage type of fit. I didn’t do one single fit adjustment (besides my normal grading up for the hips) and they’re like they were made for me. I found true-to-life bootie room, and a comfortable inseam, as well a good room for my power thighs. 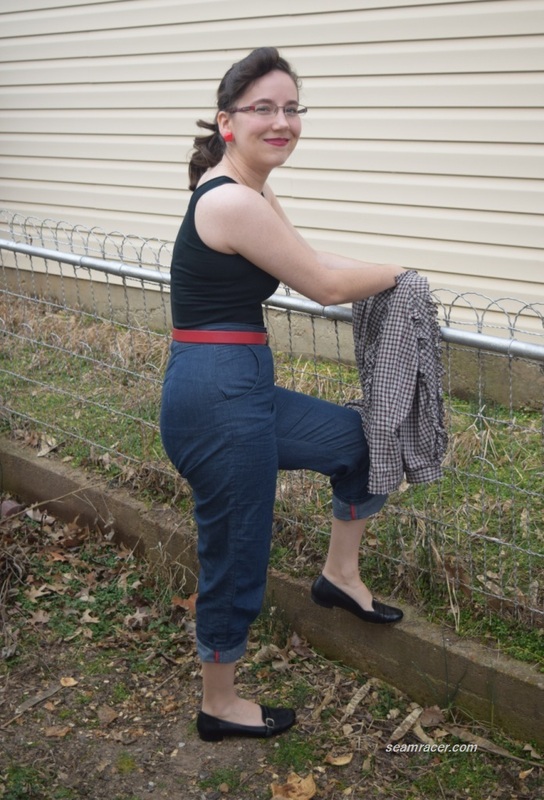 This doesn’t hide the body, but fits the body in true rockabilly spirit where the women showed off their shape through a skimming fit (think of wiggle dresses) and peek-a-boo features of their clothes (like the tie off crop top included in the Gertie pants pattern). I think Gertie’s pattern has the perfect balance of close fit combined with enough ease to be comfortable. The high waist is much appreciated here but for some reason my waistband has the aggravating tendency to roll and wrinkle. I used a stiffer interfacing but the waistband continually needs straightening out unless I’m wearing a belt. And yet, a belt doesn’t work too well on its own because I don’t have carrier straps to keep it in place…at least not yet. As much as I love the pockets I do find a weird pull at the side seam corners of them. The pants have such a snug fit I can’t really put anything bulky inside the pockets either, but there is enough room for a to-do list or a handkerchief. 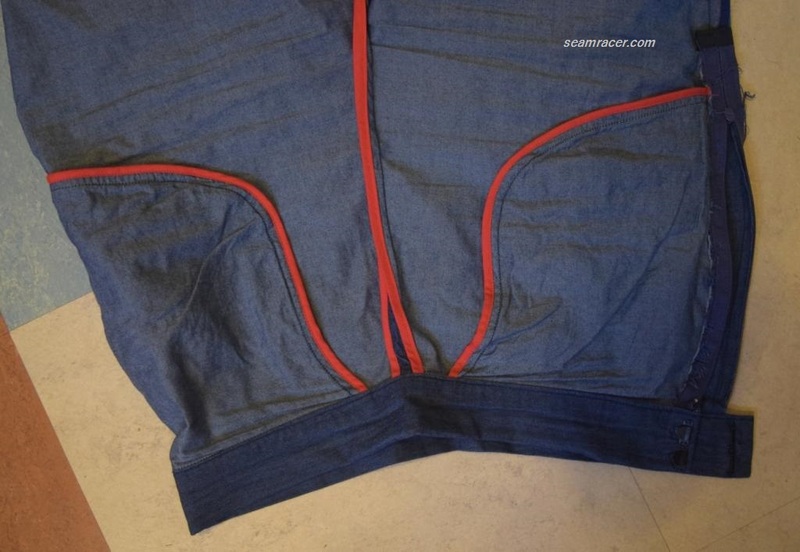 Some of the weird pulling could be because of the zipper in the side seam. The pattern originally called for (of all things) a zipper down the center back bootie seam. 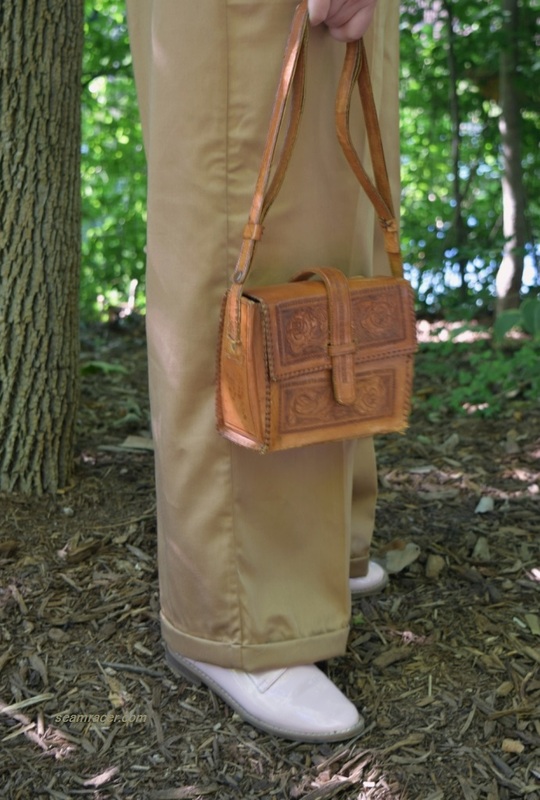 I have seen this in a few vintage pants patterns, and I did put it in that way at first but found it just too weird, odd, and embarrassing. This is why I buckled down to unpick (something I hate doing) so I could sew the zipper in the left side instead, like conventional pants. Without being rolled up higher, the original length of the pants’ hem is ankle skimming on me. I like the cuffs better mostly because it shows off my fun bias binding and is more rockabilly, anyway. Now, where’s my opportunity for a motorcycle ride?! Can I ride with a young Elvis please? Maybe, I’ll just have to settle with some good listening of some 50’s Memphis blues music or old time Patsy Kline country classics – always great, anytime. It’s way too fun to let myself give in to my strong tendency to do pretty dresses. With the weather turning chilly, I could use something different that isn’t quite so dressed up to keep me cozy. So, now that I’ve been recently realizing the beauty of 1940s casual wear, through the inspiration of actresses Gene Tierney, Ava Gardner, and Hayley Atwell (a.k.a. 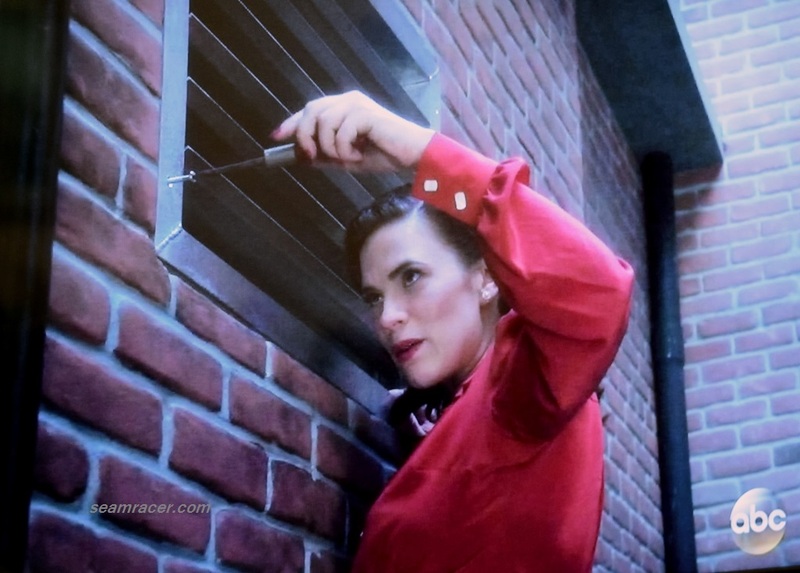 Agent Peggy Carter), I took two mid-40’s vintage original patterns from my stash to make my own downtime wear from the past. There is something a bit timeless, tasteful, and special about a set of “down-time” clothes made in vintage style that modern ready-to-wear cannot have. The 1940s can make wearing a man’s style look so ladylike! 1946 is the magic year for my blouse. Not only is it the year for the pattern of my blouse, but it is also the year of my inspiration. 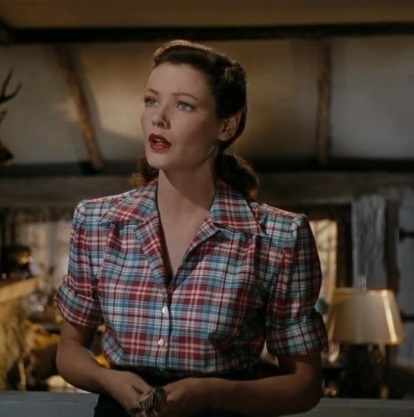 Gene Tierney wears a lovely flannel shirt in her Noir movie “Leave Her to Heaven”. Once I’d seen this movie, it has tendency to uncomfortably stay in back of my mind and the fashions are equally memorable in a better way. Luckily this movie was specially made in color (a rather special practice for the times) and I was so happy to find a plaid in a shockingly close color scheme. Ava Gardner also wore a nice flannel blouse in her gritty part in another 1946 movie “The Killers”, as also did Paulette Goddard in the 1948 movie “Hazard”, though as both films are in black and white I don’t know the true colors. 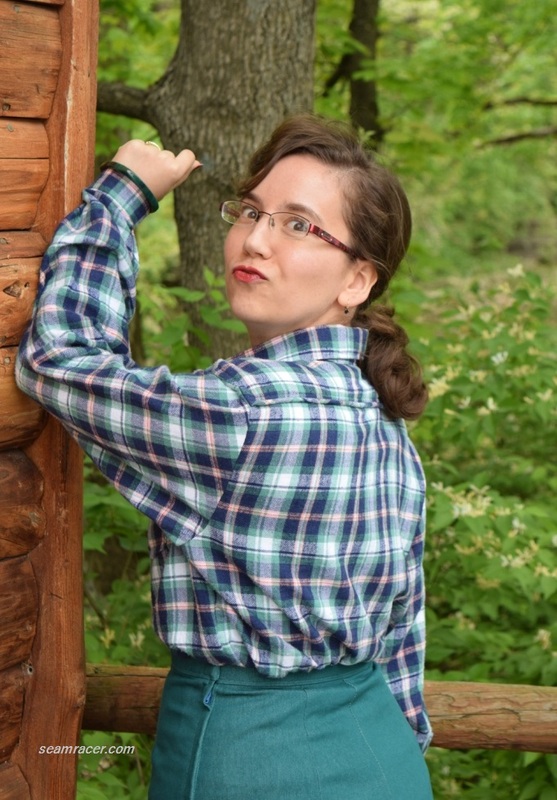 You can visit my Pinterest page for “Ladies Lumberjack Blouses in the 1940’s” to see pictures of all movie inspiration mentioned for this blouse, as well as others, too. Both actresses Tierney and Atwell wore perfectly fitting bifurcated bottoms in colors, as did Marvel’s television heroine Peggy Carter. They all put the “class” into “classic”. 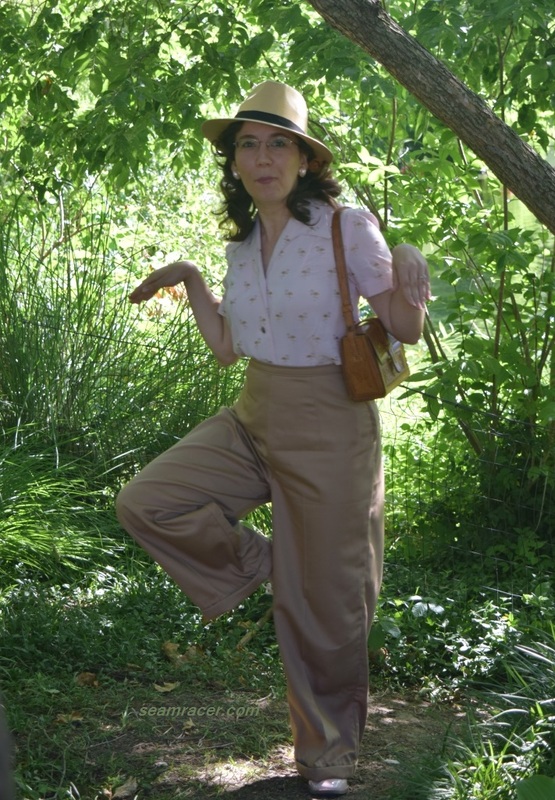 Peggy wears such wonderful trousers during the exercising of her duties on the job, and although the inspiration garment came from her Season Two (year 1947), she is often stuck in the past. Thus I feel using a pattern from an earlier date (1943) suits appropriately. 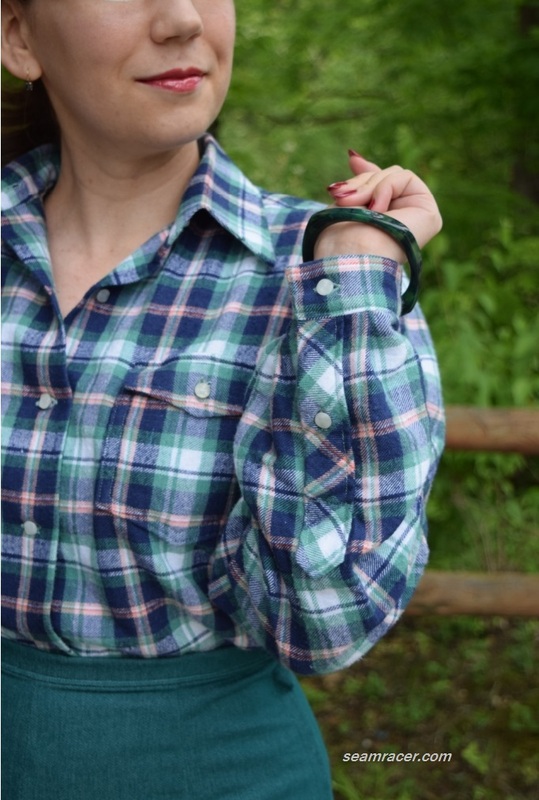 My spin on feminine menswear from the 40’s is completed with nail polish (Cover Girl XL nail gel in “rotund raspberry”), red lipstick (Cover Girl Continuous Color in “vintage wine”), my sole Bakelite bracelet, and a simple ponytail! 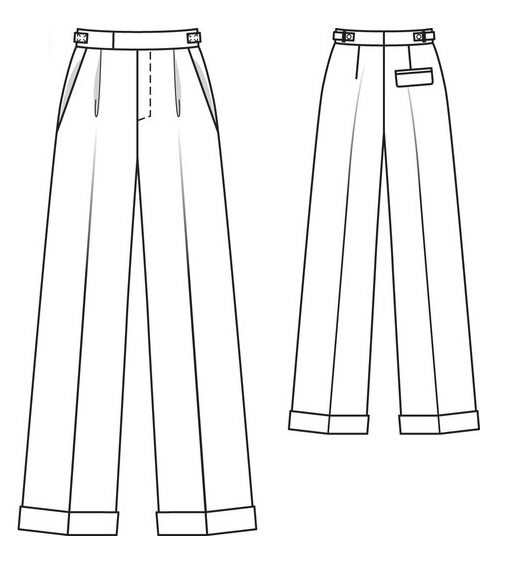 FABRIC: BLOUSE – 100% cotton flannel, with cotton batiste scraps for lining the shoulder placket; PANTS – a mid-weight denim, 60% cotton, 36% polyester, and 4% stretch. NOTIONS: I relied on what was on hand and actually had everything I needed – the thread, interfacing, bias tape, zipper, waistband hooks, shoulder pads, and buttons (which came from hubby’s grandmother’s stash). TIME TO COMPLETE: The pants took me about 5 hours in all from start (cutting) to finish, which was on March 4, 2016. I spend maybe 30 or more hours to make the flannel shirt, and it was done on April 27, 2016. THE INSIDES: The denim of the pants was too thick to add more bulk with edge finishing, so they are left raw. The shirt is nicely finished in either French seams or bias bindings. TOTAL COST: The denim was on clearance when the now defunct Hancock Fabrics was closing, so it cost maybe $6 for only 2 yards. The flannel came from Wal-Mart and cost $7.50 for 2 ½ yards. So my outfit cost less than $15 – good deal, huh?! The shirt was a bit of a time consuming trouble to do all the details while the pants were so easy and quick. Both the patterns fit me right out of the envelope no changes and no real fitting needed…it’s so nice when that happens! A decent number of the 40’s patterns run small for me so I went up in size for the trousers to have a good comfy fit, especially as I was planning on tucking my thick flannel shirt in the waist. 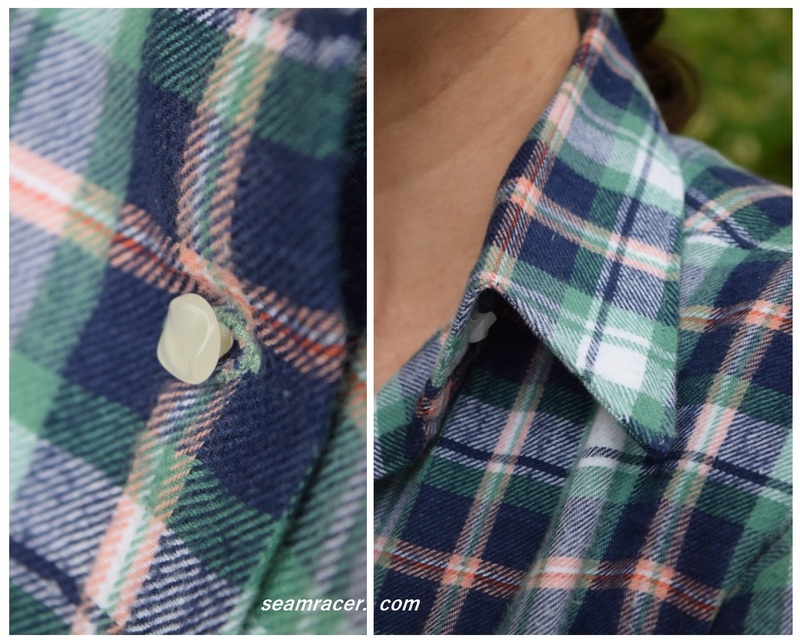 Lumberjack shirts are often roomy, so I actually went smaller by finding a pattern in my exact sizing and making wider seam allowances. Both steps were good ideas though the pants are a tad baggy when worn with lighter weight blouses. My flannel blouse served as an experimental piece on which to attempt two techniques for the first time before doing them on some upcoming projects. 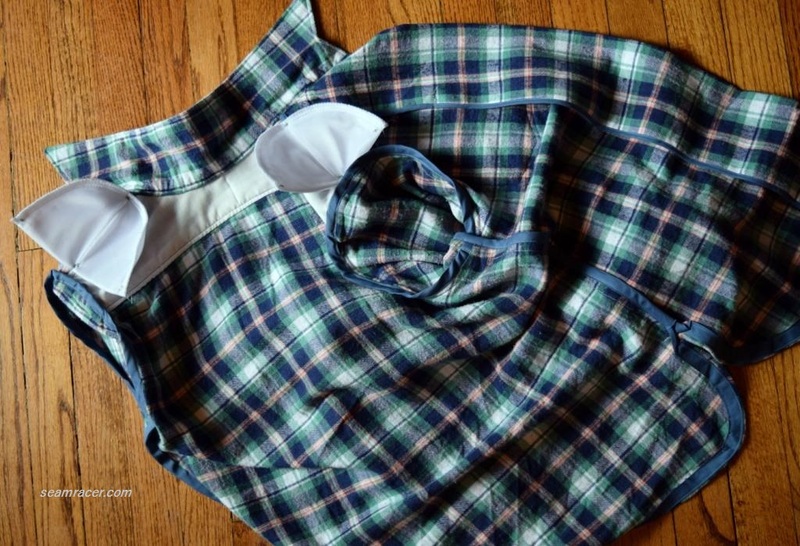 As the back has a separate shoulder placket, and I did not have enough fabric to do something special (like mitering the plaid into V), I made my very own corded piping using self-fabric to make sure that seam has a special touch. Making my own piping was not hard – it was fun actually! All it took was a little extra time but is so worth it in the finished appearance. I even cut the strip of fabric for the piping on the bias for more contrast. 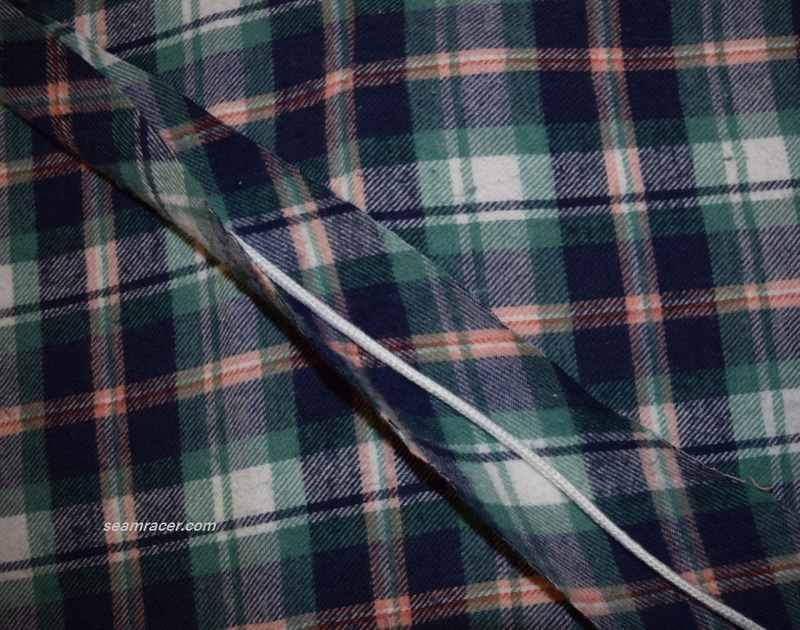 See – the plaid is cross-grain. Also, I found out how to do sleeve openings with a pointed over-and-underlapped placket. They turned out great, but now I know what to do better next time. Making these plackets became challenging with the flannel becoming so thick with multiple layers in one small spot, and they were barely all my machine could handle to sew. I really do love the look of this kind of placket – so professional and finished looking, and special, too, as it was also cut on the cross-grain! I can’t wait to try out these two techniques again. The buttons on my shirt are vintage, as I said they come from the stash given to us of hubby’s Grandmother, but what era I’m not sure. These buttons came in the number I needed, but they are also tiny and feminine, which is exactly what I wanted for the shirt, although they do kind of make it hard to button through the thick flannel. 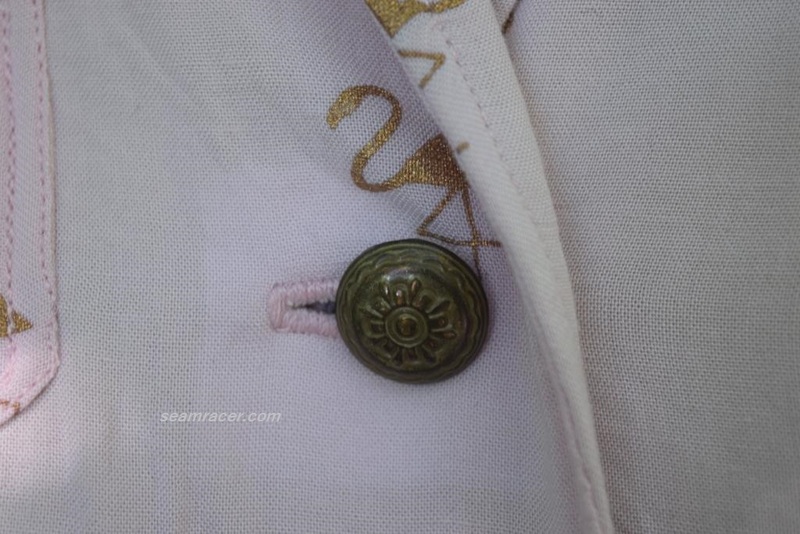 The buttons had been coated with an imitation pearl stuff, but as most of it was coming off anyway, I used a pocket knife to take all of the coating off to have the buttons be a creamy white as you see them. They are all kind bumpy on top with three small hills on each. Does anyone have any idea what era these are from? The shoulders are a bit droopy and I think they are meant to be like that but I did try to prevent an extreme case. I sewed the top shoulder seam in a ¾ inch seam allowance but as the sleeve was still over-long for my arm, I also made the cuffs in half the width they were meant to be. Thin cuffs do look a bit different but I think this is a good save versus having the sleeves end up looking way too big for me. I also added thick ½ inch shoulder pads inside the shirt to further structure the blouse’s silhouette, because the droopy sleeves fit better with them and also…this is the 1940’s after all! Out of everything else on the shirt, it’s the shoulder pads that make me feel like this shirt is more like some sort of loose, unlined jacket. I find it so funny how ginormous thick shoulder pads fit in so well with 1940’s fashion, they actually look good, and fit in to the garment’s style so well. You’d never have guessed huge shoulder pads were in there, would you? My trousers are so freaking awesome, I can’t praise true 1940’s high-waisted pants enough. My last attempts were done using reprints of old patterns from Simplicity, and although they turned out decently enough, they seem modern and pale in comparison to the real vintage thing. 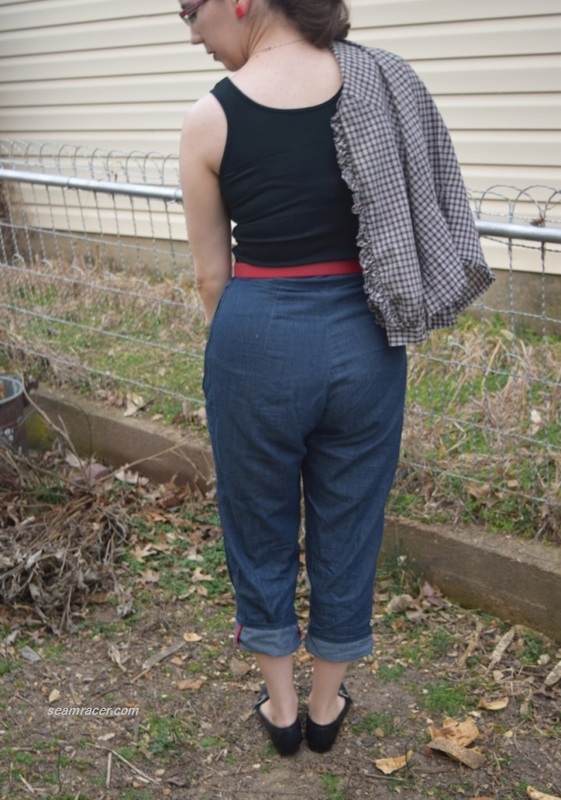 The reprints (especially Simplicity 3688) don’t have a proper vintage high waist, good crouch depth, and proper hip room that this old trousers pattern has to it. The envelope back calls the set “pajamas” but I technically think that this set of tunic blouse and trousers is actually like a house outfit, probably worn as an option to the house dress. 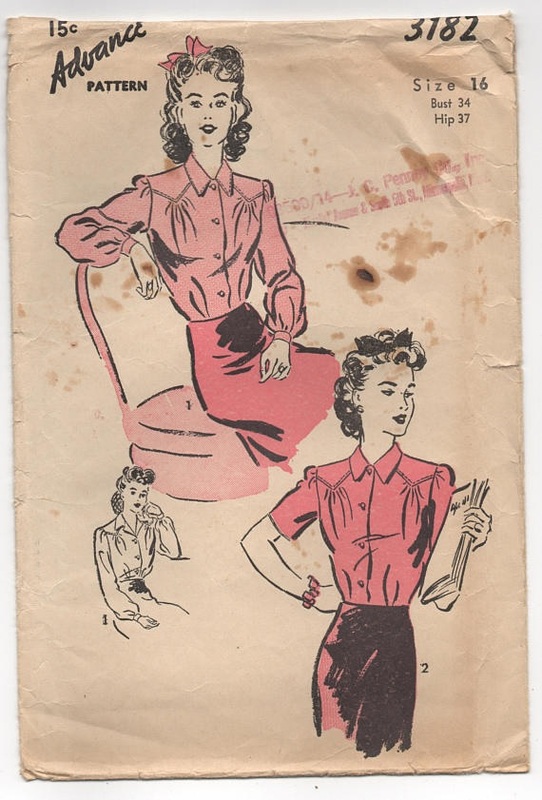 Regular ‘blouse and slacks’ vintage original patterns for women seem to sell for more than I can reasonably spend, so this pattern is my affordable substitute. The design is probably a bit more simplistic than an-outside-the-house pair of slacks, but they fit me better than I could have ever hoped for so that’s reason enough for them to deserve to be worn to be seen! The only small thing I did change was to transform a full dart out of the pattern’s prescribed knife pleat. Just to be on the safe side, I added about 2 inches to the hem of the pants, but as they turned out, I didn’t need that extra length, so they have a very wide hem – no so 1943 at all when excess fabric like this would have been a waste not allowed by the war rations. Next pair (yes, I am definitely making another) will not have the added length and wide hem – the pattern is just fine for me the way it is. 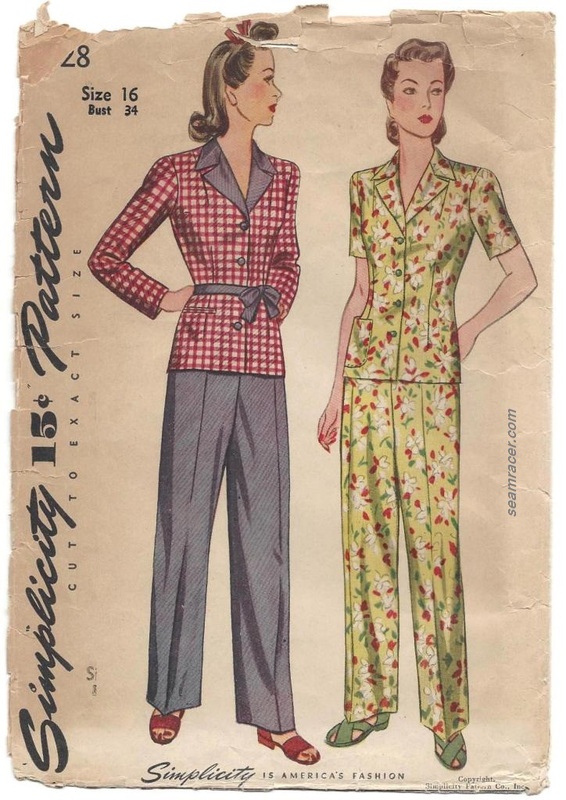 I have found a body match in this 1943 pants pattern. My trousers have seen so much use since I finished them, but here’s a different perspective yet. I think they looked best the way I styled them to wear to our town annual WWII re-enactment weekend several months back. I wore my white scalloped front blouse with the trousers, a leather belt which matched my studded wedge leather sandals, pearls, clip-on earrings, and a netted snood I my hair. A re-enactor told me he thought I looked like I was dressed up like I was a French civilian. 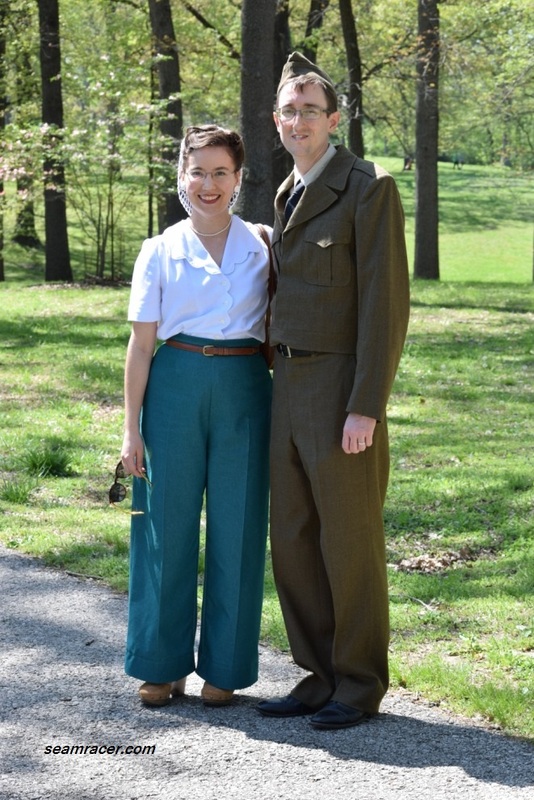 My hubby can be seen in his recent lucky find of a never worn, Eisenhower-style, military suit set (just need to hem his pants…). These service suits were being worn on limited personnel in 1943, but became standard issue after November 1944, so he and I are not too far off in time frame. If I am re-enacting a French civilian, maybe I can play the part of the bride that he met while serving the European front of the war. Do you, too, have some “inspiration icons”? Do you sew your own casual wear, weather vintage or modern? Have you, like me, happened to find a magic pattern that seems as if it was meant for your body? Happy Thanksgiving to all of you! Here’s to best wishes for good eats, good times, and good memories!